Charles Frey ’19 — Walls are decaying and caved in. Windows are busted out, shards of jagged glass cover the sidewalk, and the bars in front of what used to be a door are locked tight. The words “No Trespassing” is seen on the side of the building, next to some green graffiti. Walk two blocks toward the square. A grassy field in front of a law building. Bright white, tall, and imposing. Surrounding it on all sides are equally impressive buildings. On the other side of the street are brick businesses, closed for the holiday. These were the two sides of Meridian, Mississippi I saw while following the town’s Civil Rights Trail. Both formed an emotion I’ve felt elsewhere along the journey south. It’s a feeling hard to put my finger on, but one I can only describe as “time-locked.” I don’t want to say regressive because to be regressive would imply falling back. I can’t say progressive because, while there are many signs of moving forward, historic sites are fading into obscurity. Meridian is time-locked, unsure of how to move forward yet determined to extinguish its past. Yes, information plaques mark sites with facts about people, dates, and events, but the locations in which these events happened are disappearing. And Meridian isn’t the only place. In Selma, Alabama we walked from the Brown Chapel A.M.E Church to the Edmund Pettus Bridge, and along the way I witnessed similar scenes of poverty combined with progress. An informational kiosk about Civil Rights leaders had been vandalized and just recently was replaced. Even with the new replacement, the informational canvas was already beginning to fray. In Monteagle, Tennessee our bus stopped briefly at the site where the Highlander Folk School stood—a location that trained many of the Civil Rights Movement’s prolific leaders such as Rosa Parks, Martin Luther King Jr., and members of the Student Nonviolent Coordinating Committee (SNCC). Because of the school’s involvement with the CRM, it closed its doors and moved to Knoxville in 1961. It’s original site? An abandoned shell of a building surrounded by rural homes. Over the years, there hasn’t been enough action taken to maintain these historic sites. Despite the passing of the Civil Rights Act in 1964, attitudes in the South have hardly changed regarding the preservation of African American heritage. Yes, the nation has propelled past segregation, but ignorance has halted the progress of select southern towns—progress that should have happened 50 years ago. Brian Parks ’18 — The today was a really interesting day. We took a walk through the downtowns of Jackson and Meridian downtowns. When we arrived in both cities the location seemed like a ghost town most likely because it was Thanksgiving Day. We first started in Meridian and something I noticed that was really strange that they had a lot of horses made of stone throughout downtown. I assumed that the town really loved horses and were used abundantly in the past. However, I did research on the horse figures and I found they were used to promote community pride, spur tourism, instill an appreciation for art and to help the children that are orphans. I found this very fascinating about the city. After the short trip in Meridian, we visited Jackson Mississippi which was very memorable. We first took a long walk throughout downtown and through a neighborhood. I quickly noticed how run down the city looked from an economic sense. Although it seemed like an underdeveloped environment we still saw monuments with a rich history. We walked by many music commemorations of Blues and learned the impact it had on the city. Some of these industries included Okey Records and Trumpet Records which are very prominent studios in during their respected times. 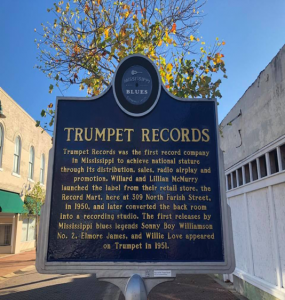 After seeing the rich music history of Jackson our next stops were of very sad moments during the Civil Rights Movement. This made me appreciate all those who paved the way for all minorities and myself. There are no words that can do justice to give the men and women gratitude and respect they deserve and who gave their lives to people then and generations to come. Henry Swift ’18 — Today we woke up in Anniston Alabama and went on a walking tour of the town. We followed the “Anniston Civil Rights Trail”, which included the former bus station that the Freedom Riders stopped at. The protestors got off the bus here and were beaten up by a mob, the same bus was firebombed leaving town. 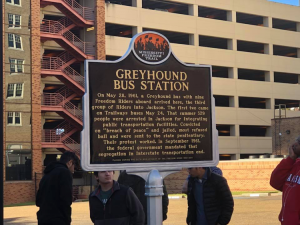 We made a quick stop there to see the site of the firebombing, and after that we left for Birmingham where we saw the 16th St. Baptist church and the Birmingham Civil Rights Institute. What stuck out to me the most from today was the difference between the white and black people that lived through the civil rights movement. We talked to a lady at our hotel this morning that was a local in Alabama. When we asked her about her experience during the sixties, she said that she did not really notice any change in her life, which struck me as a prime example of white privilege. I thought this because she was able to live through a time of monumental change and barely notice it. We later talked to a tour guide who met Dr. King and was active in the Birmingham Movement. He treasures his time with Dr. King and his involvement in Birmingham. It was heartwarming to see his eyes light up as he talked about his time with the famed reverend. Another site that really stuck with me was the Birmingham civil Rights Institute. The exhibit did an excellent job of showing the growth of Jim Crow from the 1960’s to present day. Part of the exhibit showed a white and a black classroom side by side, and I thought the contrast images was extremely important. The white classroom was modern and well appointed, whereas the black classroom was a one room cabin. The stark difference between the two was startling. That exhibit demonstrated again that segregated facilities were not and had never been ‘equal’. It showed that separate but equal was a myth and how bad the difference between white and black facilities was.